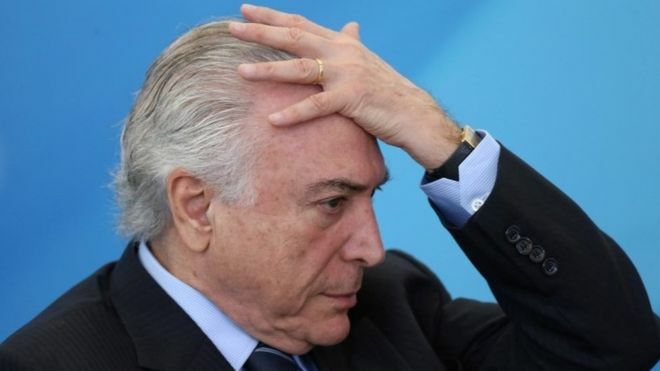 A congressional committee in Brazil has voted against recommending President Michel Temer be tried in the Supreme Court on corruption charges. The vote reduces the chances of the president appearing in the dock. But it is non-binding and still needs to be approved by the full parliament. The public prosecutor has said he will instigate new corruption charges. Earlier ex-President Luiz Inacio Lula da Silva said he would seek re-election despite a corruption conviction. Mr Temer was charged last month, accused of plotting to receive bribes from the boss of a giant meatpacking firm. He has denied any wrongdoing. The final decision on whether he is tried by the Supreme Court lies with parliament, who is expected to vote on the matter within days. In order for Mr Temer to face prosecution two-thirds of the 513 deputies in the lower house need to approve the charges against him. The government is confident it has sufficient votes to block an eventual trial.